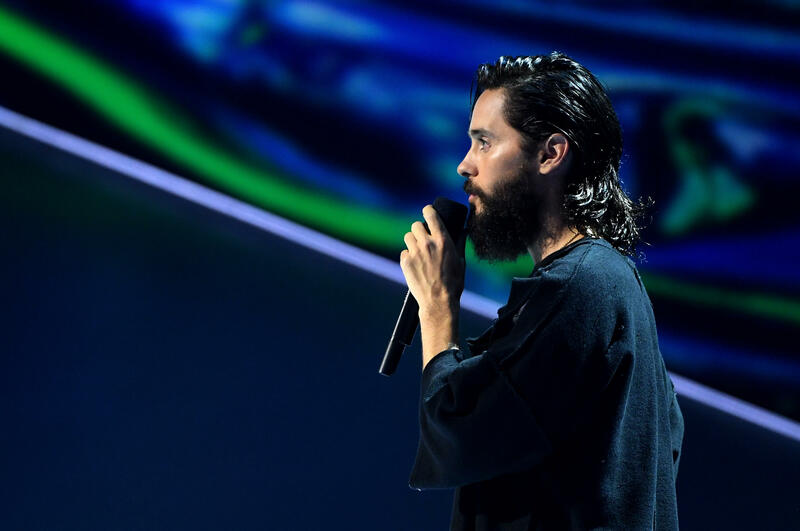 Jared Leto paid a moving tribute to his late friends, Chester Bennington and Chris Cornell, at the MTV VMAs. Leto, who is the frontman of the band Thirty Seconds to Mars, said he toured with both Bennington and Cornell. He specifically talked about Bennington's remarks at Cornell's funeral. Leto said, "Chester said of Chris, 'Your voice was joy and pain and anger and forgiveness, love and heartache all wrapped up into one.' Just weeks later, Chester himself was gone. Chester was my friend as he was to so many and witnessing his life taught me important things, especially about working relentlessly, pursuing dreams and being kind and caring while doing it." Leto continued and said of Bennington's legacy, "When I think about him, Chester, I see his face, which was always smiling. I think about his heart, which he wore on his sleeve. I think how kindly he treated me, my brother and Tomo [Milicevic], our band. I think about his wife and his six, six incredible children. I think about his family. I think about his band who were really his brothers and I remember his voice, at once ferocious and delicate. That voice will live forever." "If there's anyone out there who feels like there is no hope, hear me now," he added. "You are not alone. There is always a way forward. Reach out, share your thoughts. Do not give up and I promise you this: The absolute biggest breakthroughs in life lie just beyond the darkest days." Cornell died on May 28 and Bennington sang "Hallelujah" at his funeral. Bennington died on July 20 -- what would have been Cornell's 53rd birthday. Both deaths were ruled as suicides.